In certain situations, a collection of atoms can transition to a superfluid state, flouting the normal rules of liquid behavior. Harnessing this effect is of particular interest in the field of atomtronics, since superfluid atom circuits can recreate the functionality of superconductor circuits. 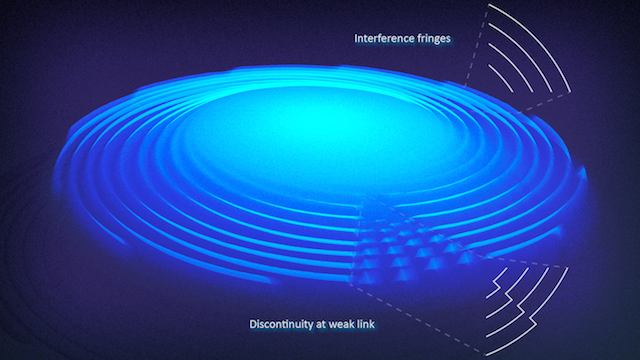 PFC supported scientists have developed a method for analyzing a superfluid circuit component known as a ‘weak link’. The result is the first direct measurement of the current-phase relationship of a weak link in a cold atom system. Measuring the current-voltage relationship, or how the flow of current changes based on a voltage change, is an important way to characterize an electrical circuit element. In a superfluid atom circuit, an analogous measurement of interest is the current-phase relationship, basically how a particular atomtronic element changes the flow of atoms. The physicists confine a condensate of sodium atoms between a sheet-like horizontal laser and a target shaped vertical laser to create two distinct clouds. They then apply another laser to the outer condensate, slicing the ring vertically to create a low density region known as a weak link. When rotated around the ring, the weak link acts kind of like a laser ‘spoon’, ‘stirring’ the atoms and driving an atom current. After turning the lasers off, the clouds expand towards each other, and the researchers can use the resulting interference pattern to discern features of the system. Extending the same methods makes it possible to characterize other weak links as well, and could be used to verify a type of weak link called a Josephson junction, an important superconducting element, in a cold atom system. Characterizing the current-phase relationship of other atomtronic components should also be possible, broadening the capabilities of researchers to analyze and design new atomtronic systems.